Shane and Lissie first met fleetingly in 1998 in Brisbane; both part of one big interwoven friendship circle. 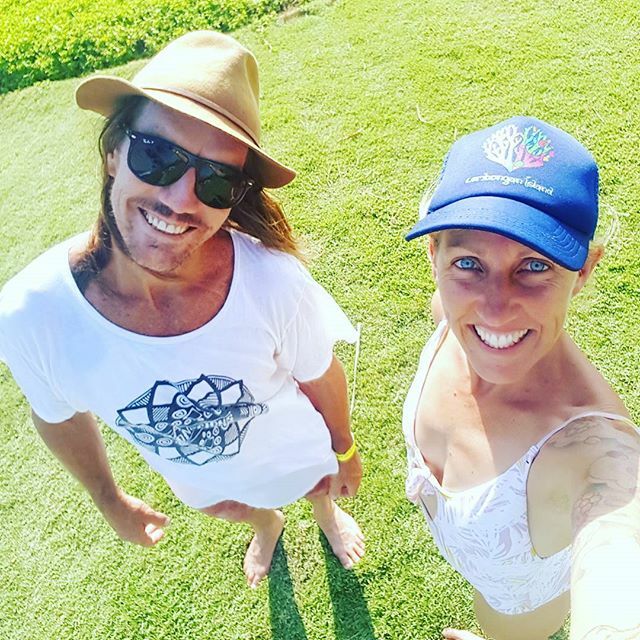 It would be many years before they would meet again, reuniting a decade later in Byron Bay, Australia where they connected in love, family and in yoga. Shane’s first encounter with yoga was at age 24 in Kathmandu. As a landscaper for many years, his doorway to the yoga path was through asana for a very tight and heavily worked physical body. By the time he and Lissie came together in partnership some 11 years later, she too had been exploring yoga for many years. For her the in-road was her first pregnancy. At 21 years of age, carrying her first child she found herself in a pre-natal class In Cairns, Far North Queensland where she fell in love with bhavana – the tool of visualisation. With nearly 4 decades of practice between them, they sat down together one day and felt very strongly that it was time for them both to teach. In 2010, Shane went into 8 weeks of intense and immersive study and training with Lance Schuler, Claire Priestley, Phillip Lemke and Steve Hanmer. It was a journey that would crack him open in the very best of ways and then too Lissie, two years later; 6 months after their youngest son was born. In 2012 they built their own shala and have since taught more than 5000 hours of yoga within those walls alone. Lissie is a fully accredited Level II Teacher as well as Yoga Therapist having trained intensively for 3 years, with the former Director of KYM (Krishnamacharya Yoga Mandiram) and one of the world’s most experienced and recognized Yoga Therapists, Dr Natesan Chandrasekaran MD. In clinic she specialises in endocrine health, addiction recovery and disturbances in the manomayam and vijnanamayam – anxiety, depression and associated disease pathology. Lissie utilises the tools of yoga to address the needs of individuals. She runs regular workshops on the basics of breathing and restoring high quality breathing as the foundation of all asana. Shane's profound knowledge of muscular effect and energetic release takes shape in all of his teachings as well as in his dharma as a Zen Thai Shiatsu Massage Therapist. His hatha foundation built on the fundamentals of good breathing in the teachings of the Krishnamacharya lineage, features modifications flavoured by his training with Gwyn Williams in Zen Thai Flow. Shane’s studies in TCM, play a role in all of his postural modifications and he runs regular trainings for upcoming therapists and for those simply interested in making connection with others through movement based therapy. Their journey of yoga continues to unfold every single day, understanding that there is not a single moment in life that is not part of the practice. Constantly in practice and in study, reflecting over and over again; every decision on the mat and in their lives guided by the teachings of yoga through Patanjali’s Yoga Sutras and the lineage of Krishnamacharya.